If you have mobility problems, then you must be accustomed to the difficulties that you face while using regular toilets. It may be difficult to incline or bend too low or to get up straight after using the toilet. It is also possible to lose balance and injure yourself. There are better options and efficient ways to solve this problem rather than raising the toilet seat which is neither cost-efficient nor affordable. You can find some accessories which come in universal design and fits all toilets. You don’t need to modify the existing toilet seat and you can remove the seat anytime if you don’t need it. There are also specially built Raised toilet seat for elderly and handicap people give them full support and convenience. The Vive is a popular brand who produces comfortable designed to the raised toilet seat for the elderly or handicapped people. The designs are ergonomic, making it easy to sit down and stand up for the people with disability or mobility problem. Product information: It supports up to 250 lbs. Installation process: It is easy to install, store and great to carry while traveling. Lock tight latch securely installs handles for added support and confidence. Easy setup without the requirement of any tools as it has adjustable knob latches. Caring tips: A simple wipe with a standard bathroom cleaner. Carex Toilet seat assists the handicap people and elderly persons or who have difficulty with bending or sitting. The smoothly contoured seat and easy to use locking system and also the great built-in hand grips are some of the great features of this toilet seat. FITS ROUND TOILETS: This elevated toilet seat with arms adds 3 1/2 inches of height to your toilet seat. 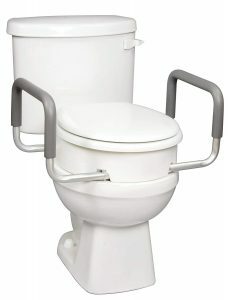 Provides secure, reliable, elevated fit for standard round toilets. This toilet seat helps the users to use with the original toilet seat and is perfect for the patients and handicapped people who cannot sit properly and use the toilet. It gives support while sitting down or getting up. This toilet system provides additional security and support. It is compact and lightweight for extra comfortable feeling. It supports the handicapped or elderly people while sitting or standing in a safe and secure way. The safety rails do not interfere with the siting process. We recommend this for its hardy aluminum built quality, perfect product to use for the people in need, and lifetime use warranty. Installation Process: It has easy and tool-free installation as no drilling or cementing is required. Raised toilet seats are chosen and designed with the purpose of helping people who have limited mobility issues and need a safer way to use the toilet. It decreases the distance from a standing position to their toilet. It can be fitted to most toilet seats with a proper and correct installation. This is one of the most convenient options, providing assistance when getting on and off the toilet seat for anyone who needs it.